Our goal is to provide you with the highest quality of periodontal and dental implant care in a comfortable, safe and caring manner. We utilize the latest techniques and medications to ensure your comfort. Attending to your concerns and questions is our number one priority. On your first visit to our office, we will give you a complete examination and then explain everything. We recommend only the most proven techniques. If there are several options for care, the benefits of each will be discussed. All of our doctors attend many hours of continuing education to provide you with the highest standard periodontal and dental implant therapy. We work hard to ensure you will receive the best result. You can depend on us. Please call us at (952) 935-9009 at your earliest convenience. If you are considering a dental implant you are in good hands. We have been placing dental implants for more than 20 years and are among the top providers of dental implants in the Twin Cities area. The surgery (including shots) was painless. Dr. Skinner and staff are great. The surgery (including shots) was painless. My gums look great – I haven’t had any pain or complications. I plan to come back to get my other gum grafting done. I also want to add a few comments about my visits to your clinic. Your support staff from Chris in the lobby to the assistants dealing with me were the best I have ever experienced. I was actually looking forward for each and every visit. Thanks to all of them for treating me like a human being. And to you Dr. Skinner, thank you for treating me as a person and expressing interest in my interests. Your professionalism never threatened or intimidated me, but rather gave me trust and confidence in your ability to help me with my problem. I wish all dentists could be like you. You really affected my life. I can’t tell you how indebted I feel. You really affected my life. I have great input for your skill and patient concern. Thank you for all of the good care you have given me. Dr. Skinner helped prevent critical health problems. Dr. Skinner is a special periodontist. He successfully treated my gums and participated in a tooth implant. Not only he was very skilled and professional but he took the time to look at the whole patient and not just the present problem. That second look made a crucial difference to me. During my first surgery he noted my irregular breathing pattern and suggested that I should be tested for sleep apnea. I was tested and have been using a C-Pac Machine for a year and now have deep, restful sleep. With a history of heart disease in my family that was a very good recommendation. When I had my implant procedure, Dr. Skinner noticed that there were white flecks on my x-rays. After determining that it was plaque, he called me in Florida to recommend that I have my carotid arteries checked. My ultrasound indicated that I had a 90% blockage in my right artery & the doctor scheduled me for surgery the next week. I had no symptoms and could have easily suffered a stroke. Both times Dr. Skinner helped prevent critical health problems. As a healthy woman in my 60’s I had no idea that there were underlying issues. I am incredibly thankful to him for my well-being. I highly recommend them for any procedure at anytime. I recently had three teeth (gums) repaired with excellent results!! A lot of tissue was cut and moved for this procedure without any problems. It was painless. Drs. Lowe and staff employees were friendly, patient and truly cared for me. I would think they treat all their patients this way. I highly recommend them for any procedure at anytime. In fact I have two other recessed teeth/gums I may have done now rather than later. Even my dental clinic commented on such a good job done and were impressed. Dr. Malek is an excellent doctor. Dr. Malek is an excellent doctor. He is skilled, compassionate and professional. I have complete confidence in his care. And welcome my return visits. I feel confident in the dental services rendered today. The team of Dr. Malek and dental assistant Stacy was very thorough and caring. The three hour appointment was relatively comfortable. I feel confident in the dental services rendered today, and will return on a regular basis. I had the best dental experience. I had the best dental experience. You didn’t rush me and you took the time to explain all I needed to stay healthy. This procedure will have better long term result as the adjoining teeth will not be impacted as they would with a bridge. 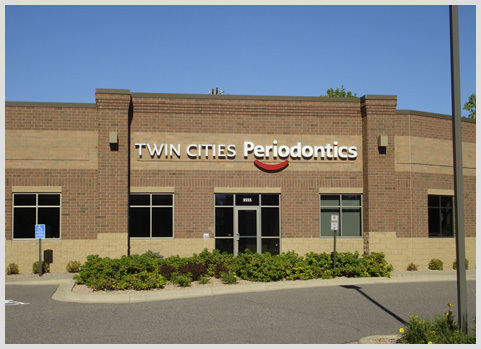 I recently had a dental implant at Twin Cities Periodontics – this was a new dental experience for me. I’ve had the usual apprehensions & concerns. The procedure was painless as was the aftercare of implant site. You will be given the choice of medication (a pill) which helps you to completely relax & sleep through the procedure – I took the pill and slept through the complete implant – no after effects – it was great.